Ridley Duchannes will be the first to tell you that she’s a bad girl. She’s Dark. She’s a Siren. You can never trust her, or even yourself when she’s around. Lucky for her, Wesley ‘Link’ Lincoln can never seem to remember that; quarter Incubus or not, his heart is Mortal when it comes to Ridley. 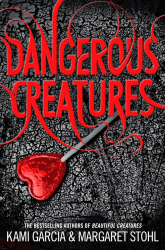 Dangerous Creatures, begins with Lena, Ethan, Liv, John, Link and Ridley (from ‘Beautiful Creatures‘), meeting up for one last time before they go their separate ways. Lena wants them to perform a binding cast, so that no matter where they are, they will always be there for each other. The binding cast produces rings which they each have to wear. Quarter Incubus, Wesley (link) Lincoln is off to the Big Apple – New York, to pursue his dream of becoming a rock star. He’s dreamt about this moment for so long, that no-one will stand in his way, especially his Mamma, who believes he is off to college. Ridley decides to join Link, as she has nothing better to do (or more appropriately to get herself out of trouble). I loved the Beautiful Creatures books, so I was more that thrilled when I heard there was going to be a spin off following Ridley and Link. Dangerous Creatures, did not disappoint. Delving deeper in to Ridley and Link’s lives and their on/off relationship, you get to discover more about the two of them, as well as meet some new lively characters. Ridley is a Dark Caster. She is manipulative, hurtful, scheming and demanding, but for some reason, Link is in love with her, and all though she would never admit it, she loves Link too. When Ridley’s past starts catching up with her and puts Link in danger, we get to see a softer side to her as she realises that sometimes you have to put others before yourself. It was nice to see Ridley actually have an emotional side, rather than her usual careless attitude. Link is so focused on making it as a rock star that he can’t see that Ridley is trying to help and protect him. He starts to back away from her, learning to stand up to her, just when she is needed the most. It’s like he’s walking round with his eyes shut, he can’t see what’s developing right in front of him, or what danger he is in. He Disbelieves Ridley when she tries to warn him and breaks off their relationship, when at last she is telling him the truth. One of my favourite characters was Lennox Gates (Nox). He’s a Dark Caster, with problems of his own from the Underworld. Lennox is the reason that Ridley is in trouble, and the reason that Link has a place in his band, at his night club (Ridley lost a card game and owes Nox two markers, one being to find a drummer for his band). Nox is a troubled man. He puts on this brave, fearful exterior, but really he’s in a tricky situation himself. He’s in love with Ridley and although she is with Link, there is a connection between them. Although I love Link, I was secretly hoping that Nox and Ridley would get together as they seem perfect for each other. The story is fast paced and with lots of twist and turns, mysteries, heartbreak, love and plenty of bad boys, there is always something to keep you on your toes and interested all the way through. The book ends on a cliff hanger, and I can’t wait to start reading the next book, ‘Dangerous Deception‘. But now Ridley is missing, and Link was with her right up until she vanished. Determined to find her, Link reunites with his New York bandmates and the mysterious Lennox Gates, who wants Rid for himself. Together they travel to the deep south, find the crossroads where blues guitarist Robert Johnson made his deal with the devil, discover a menagerie of Casters locked in cages, and uncover an evil in New Orleans that threatens to destroy them all.